The Creator Ops STEAM: The Breakout space! What is the 'Breakout Space'? The Breakout Space is a small space to 'Breakout' and have a area where it is just quiet and so you can produce more ideas. It is an area to give your brain a bit of a break. The purpose of the Breakout Space we created was so you can get away from the noise and give your brain a break from the pressure. 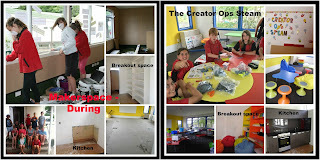 What does the Breakout Space look like?